The gunman who went on a chaotic rampage killing four people before being fatally shot by police at a college campus planned the attack and was capable of firing 1,300 rounds of ammunition, the police chief said Saturday. 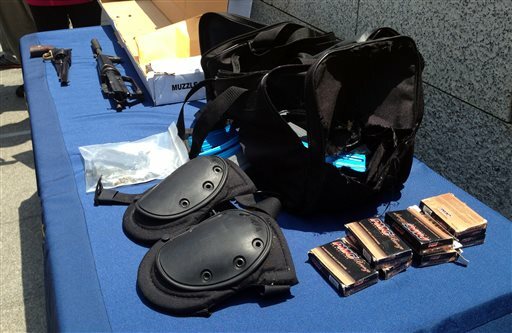 SANTA MONICA, Calif. — The gunman who went on a chaotic rampage killing four people before being fatally shot by police at a college campus planned the attack and was capable of firing 1,300 rounds of ammunition, the police chief said Saturday. “Any time someone puts on a vest, of some sort, comes out with a bag full of loaded magazines, has an extra receiver, has a handgun and has a semi-automatic rifle, carjacks folks, goes to a college, kills more people and has to be neutralized at the hands of the police, I would say that that’s premeditated,” said Chief Jacqueline Seabrooks. The killer would have turned 24 on Saturday, but Seabrooks wouldn’t identify him because his next of kin was out of the country. Police had an encounter with him seven years ago, but she wouldn’t elaborate because he was a juvenile at the time. The chief spoke near a display of weapons and ammo recovered from Santa Monica College where the killings ended Friday when police gunned him down in the library, where students were studying for finals. Among items on display were surveillance photos of a man in black entering the library with an assault-style rifle by his side. The gunman fatally shot one woman in the head outside the library before entering the building and opening fire as students ran for cover. Students hid into what Seabrooks called a “safe room” in the library and barricaded the door for safety. “They stacked items found in the safe room against the door, hunkered down and avoided shots fired through the drywall at them while they were in that room,” she said. The violence, which lasted little more than 10 minutes, started about a mile away when the gunman began shooting at a house, and it caught on fire. Two bodies were later found inside. Two officials told The Associated Press that the killings began as a domestic violence incident and the victims in the home were the gunman’s father and brother. The officials spoke on condition of anonymity because they were not authorized to publicly discuss the case. As flames rose from the house, the man, wearing what appeared to be a ballistic jacket, he shot a woman passing by in a car and carjacked another woman at gunpoint. He directed her to drive to the college campus, having her stop so he could shoot along the way, police said. He fired on a city bus where three women were left with minor injuries. One had shrapnel-type injuries and the two others had injuries not related to gunfire. They were treated at a hospital and released. The gunman also fired on police cars, bystanders and pedestrians, police said. From there, the chaos shifted to the college, a two-year school with about 34,000 students located among homes and strip malls more than a mile inland from the city’s famous pier, promenade and expansive, sandy beaches. In a faculty parking lot on the edge of campus, he fired on two people in a red Ford Explorer that crashed through a block wall. The driver was killed, police said, and a passenger was in critical condition after undergoing surgery UCLA Medical Center, doctors said. On Saturday, authorities identified the driver as Carlos Navarro Franco, 68, of West Los Angeles, who worked at the school. College employee Joe Orcutt was in the lot and said the gunman looked calm and composed as he fired at him. Orcutt jumped out of the way.